You put your key in the ignition and twist to start. Everything seems normal but the engine just won’t kick into life. It’s a frustrating situation to be in – everything seems fine, but the thing just won’t fire up. Why? It’s most likely you’ve got an issue with the battery. Modern vehicles rely heavily on electronics and need a certain voltage for the engine to start. If there’s a problem with the battery, it can mean that even if the starter motor is winding the engine over, there won’t necessarily be enough voltage to kick the engine into life. A good indicator of a battery issue are the dash lights that come on when you turn the key. If they are, do they then dull significantly when the key is turned further to start the engine? If they do dull, the problem may be a dirty or corroded battery terminal. The material that builds up around a terminal is less conductive than the terminal itself and the reduced charge may not be enough to give the engine the boost it needs. Another test for the battery is to turn the headlights on to low beam and crank the engine over. The headlights should go only a little duller. If they dull a lot, there is a battery problem. Of course, the problem may be that your battery is running flat and is nearly discharged. If this is the case, you may want to try and jump-start your vehicle to get it running. If you go this route, it is important that you do the jump-start procedure correctly - you can damage the electronics on your vehicle if you get it wrong. 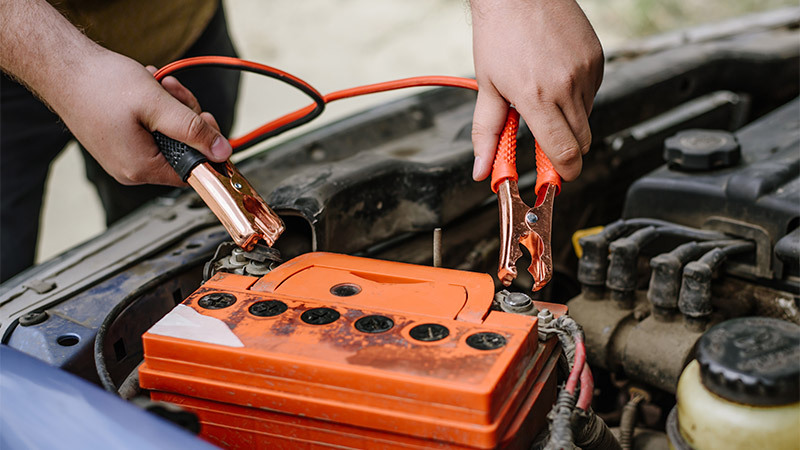 Remember that you must connect the red positive lead to the positive terminal on the battery and the black negative clamp to a good metal connection on the engine block. Your vehicles owner’s manual will give you instructions. Portable jump packs are quite popular these days but if you are going to use jumper leads and boost up from another vehicle, make sure the leads have anti-spike protection. If you suspect that your car is not winding over as well as it should, even if the battery looks in good condition and is charged, then you should get it tested immediately, before it lets you down or causes damage to your car’s electrical system. Are there other possible culprits, beside the battery? While your battery may be at fault, there are other reasons that your car can have power but not start. For example, if your car has a manual transmission, it may have a safety switch on the clutch and the clutch must be depressed for the vehicle to start. If your car is an automatic, check to see that it has been put into Park or Neutral - if it’s in gear, it won’t start. If it is in Park or Neutral, however, and still won’t start, you may have a faulty safety neutral switch. That’s a problem, of course, but It is sometimes possible to get things running by wriggling the gear shifter while holding the key in the start position. Remember, if you’ve got any doubts or concerns about your car’s performance, see a professional. While there are ways to get around some problems to get your car moving, there may be underlying issues that need to be checked. Better to get them sorted while they’re still minor. AutoGuru can help you easily book your car in for a battery inspection or replacement, you're just a click away! Zak has been working in the auto industry for 40 years. For the past decade, he has been in the education business, training apprentices and preparing them for a career in the light vehicle and auto electrical trades.